We are now the sole Irish distributor of German brand – Velo Trike. These are for people of all ages, but they are particularly suited to people with mobility or balance issues. 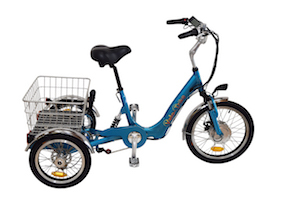 The e Trike offers the cycling experience with the security and balance of three wheels, and the comfort of knowing that the amount of exertion (or none!) can be predetermined. The Trike also has a large basket for carrying goods. Battery range is approx 50km but the Trikes can be fitted with a second battery which brings the potential range up to 100km. Please contact us if you are interested and would like to test one for yourself, a friend or a family member.